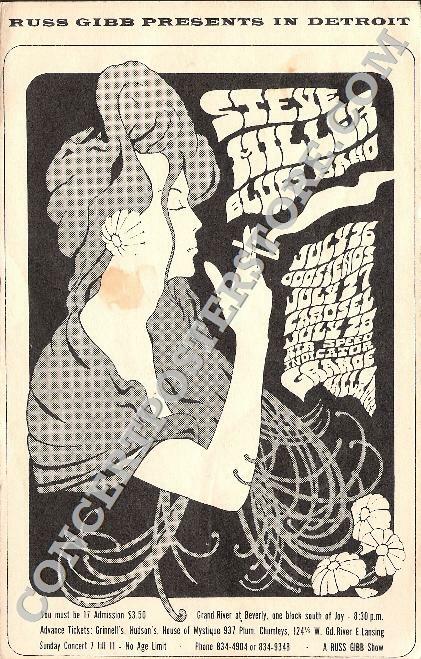 Original 1st/only printing 4&1/8 x 6&1/2" concert postcard for the Steve Miller (Blues) Band with Odds n' Ends, Carosel and Air Speed Indicator at the Grande Ballroom in Detroit, MI on 7/26-28/1968. Art by Carl Lundgren, image is #95 (card #46) in the Russ Gibb Presents/Grande series. Medium thin flat stock card is in OK (B/B-) condition; staple holes at the bottom center margin at center, a small stain at center, light handling/creasing, minor edge wear, pen writing on the reverse... still a decent example.